Today is Arthur Conan Doyle’s birthday! Martin, a blind WWI veteran and friend of Edward in WHAT EDWARD HEARD, has a special love for Sherlock Holmes and must draw upon it when Clara is accused of a shocking crime. Clara, a factory worker, becomes the victim of amnesia during an accident, throwing her into difficulty with remembering who she is. If even her name is at times a mystery, what hope does she have in remembering what really happened that night? For Edward, a far bigger mystery than even Clara’s guilt or innocence rests behind the layers of pigment that were painted centuries earlier in Venice. Martin is fond of Sherlock Holmes, but Edward has something to help solve the mystery that the great detective never had: the painted lady. 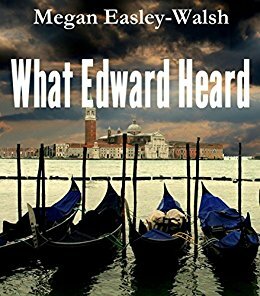 Unravel the mystery, or perhaps mysteries, in What Edward Heard.